World Wrestling Entertainment is a global entertainment brand that focuses mainly on professional wrestling. The company also produces music, films and television programming. At the An Evening With... event in Manchester, McGregor says he turned down a role in Predator, is still considering WWE. There’s a lot of offers. I got offered the Predator movie. The Pegasus [International Ad] was three days for a hell of a lot of money. I didn’t even know it was acting. I just signed on the dotted line. And when I got there they said here’s your lines and I was like ‘What the f-ck!..If I was to do [Predator] it would mean eight weeks in Toronto. You can’t do too much at once…Thanks very much for the offer. I would have been great to fight the Predator, but I’m chilling. Same way with the WWE situation. Right now I’m chillin’. I’m trying to make something historic [against Mayweather]. Long after I’m gone kids will be talking about it. [But] Never say never. I’d love to go into WWE and have a real knock. I’ve turned down some things, and others are ongoing. I’m the only one with options. Floyd doesn’t have options. I’m the A-side. WWE has made no secret of its desire to do something with Conor McGregor and there were talks between the two parties about this year. Because he’s taking time off from the UFC, there was a talk about doing something at this year’s Wrestlemania in April, but it wasn’t to be despite a hefty offer. Paddy Power offers 250/1 on McGregor entering and winning WWE Royal Rumble, which takes place on 29 Jan. If McGregor did enter the Rumble he would most likely have the biggest target on his head since Vince McMahon put a $100,000 bounty out on Stone Cold Steve Austin at the 1999 edition. WWE posts to Twitter to show that McMahon, not McGregor, originated the Billionaire “Billy” Strut. We are truly honored to have Sting take his rightful place in the WWE Hall of Fame. His contributions to our industry are unprecedented, and we look forward to celebrating his incredible career with fans all over the world. Hogan’s is fired from WWE. WWE has terminated its contract with Terry Bollea (aka Hulk Hogan). WWE is committed to embracing and celebrating individuals from all backgrounds as demonstarted by the diversity of our employees, performers and fans worldwide. Bryan is no longer at work on the company’s current European tour. All adverts for future events no longer show Bryan. Reports from earlier in the week suggest that Bryan is working with an injury, though this has no confirmation. If WWE remove one of the company’s biggest draws from their line-up however, this indicates that Bryan may at very least be set to take a short sabbatical for a while. Lesnar announces on SportsCenter that he has re-signed with the WWE and that he has retired from the MMA. I’m officially closing the door on MMA. It was a very hard decision at this stage of my career. The fighter inside me wants to compete. The father and husband — I’m an older caveman now. I make wiser caveman decisions. So, I’m here to say my legacy in the Octagon is over. It was a hard decision to make. It took me a year. I’ve thought about this for a year. At the end of the day, it’s all about me wanting to have fun. The last two-and-a-half months I’ve been training to get back into the Octagon. I felt physically great, but something lacked mentally — and that’s not good. Lee returns to action on Monday Night Raw after being sidelined with a neck injury to assist former rival Paige, who is being attacked by the Bella Twins. WWE announces Alundra Blayze, also known as Madusa, will join the WWE Hall of Fame Class of 2015 on March 28. Banks pins Charlotte in a Fatal 4-Way match, which also features Bayley and Becky Lynch, at NXT TakeOver: Rival to become the new NXT Women’s Champion. This is Banks’ first Championship under the WWE umbrella. I feel like this ten-year-old girl who started her journey watching wrestling, who was just a fan, is just – is living her dream. This is everything I’ve wanted every moment of my day – every waking moment – this is all I’ve dreamt of, and now I have it. I did it. At the 2015 WWE Royal Rumble, Lesnar successfully defends the WWE World Heavyweight Championship against John Cena and Seth Rollins in a triple threat match after pinning Rollins. The following night, Lesnar is asked about the possibility of suffering a broken rib during the encounter. That is true. I have suffered from a lot of injuries throughout my career, but when the time comes to win I get through it, and that’s exactly what I did last night. 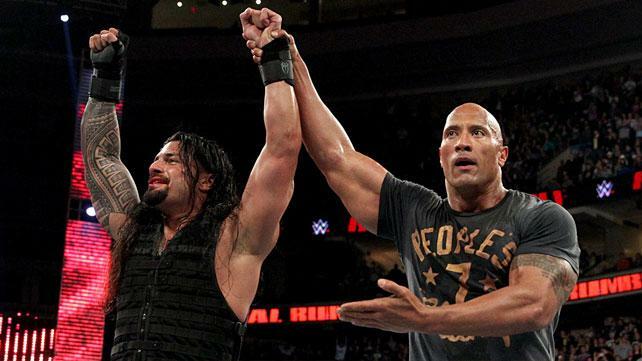 Reigns wins the 2015 WWE 30-Man Royal Rumble match with help from Dwayne “The Rock” Johnson, earning himself a WWE World Heavyweight Championship match at WrestleMania. After the match, Reigns speaks about preparing to face WWE World Heavyweight Champion Brock Lesnar. Right now I’m going to take a moment to heal. I’m busted up, I’m bleeding everywhere. I need to go see the trainer, I need to heal up, and then I need to study some tape. 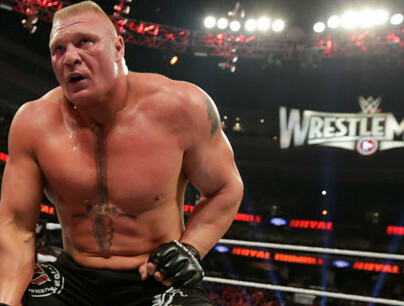 I’m going against the beast, Brock Lesnar. That’s all that matters right now, WrestleMania. One goal: walk out there WWE World Heavyweight Champion. And you can believe that. WWE announces a special Monday Night RAW titled “RAW Reunion” for the January 19th, 2015 edition of the program. The company is advertising Hogan, Michaels, Hall and Nash to make special appearances at the event. Rollins is interviewed by the UK SUN. He discusses Randy Orton and his relationship with the star. Randy and I are colleagues for sure, but we were never friends as far as hanging out. Randy’s got his life, I’ve got my life – we were business partners when it made sense. But now it doesn’t make sense any more so we’re at odds again. And if you look at the way things were when we first came in as The Shield, he didn’t like us very much then so it is one of those things where I think he has always harbored a little professional jealousy when it comes to myself. Maybe he’s a little afraid that some of the young guys are going to come in and steal some of his thunder. Ziggler takes part in a sit down interview with WWE.com to discuss his regaining the WWE Intercontinental Championship at TLC. I knew, I KNEW if I could get my hands back on that Intercontinental Championship and make it mean to them (the WWE fans) what it means to me, I knew that it would just start a rebirth for the Intercontinental title. Reks is interviewed by WrestlingINC. 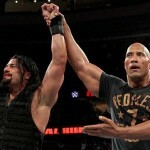 He discusses WWE’s stale main event scene and building new stars. Ambrose]. Had they started doing that a long time ago I think they’d be in a better position. Through both action and candid photographs, personal ephemera, including original Warrior art and detailed journal entries, insider stories and exclusive interviews with WWE legends, and intimate accounts from the Warrior family, this unique biography brings the legacy of The Ultimate Warrior to life like never before. Relive the Warrior’s most intense matches and rivalries, and get to know the man behind the face paint in this one-of-a-kind volume. Filled with intense action and little-known details, Ultimate Warrior: A Life Lived Forever is a celebration of the Superstar who left an inimitable mark on WWE and redefined sports entertainment for generations. WWE announces Smackdown will start airing on Thursday nights on the SyFy network starting January 15th, 2015. This is the programs second night change in its 15 year run. Reigns talks to WWE.com about his return to WWE after injury. It was like the old riding a bike thing. I can still oil up my arms, hair conditioner in, got a bad-*** vest on, still able to lace up the boots. Everything felt really good. Jericho returns to WWE to guest host Monday Night RAW live on the USA Network. WWE announces Jericho will host his talk segment “The Highlight Reel” with guest Rusev. Rollins defeats Cena in a singles competition steel cage match in the main event of WWE Monday Night RAW. Rollins picks up the victory by exiting the cage after interference from Lesnar. Harper suffers a large gash on the side of his head during his ladder match with Dolph Ziggler. The cut requires five staples from WWE’s medical staff. Harper is not removed from active competition. One Superstar has already thrown his name into the ring for the 2015 Royal Rumble Match — Roman Reigns, the runner-up in last year’s melee. The 2014 Slammy Award winner for Superstar of the Year put in an unbelievable performance last January, tossing a record-breaking 12 Superstars from the Rumble before being eliminated by the winner, Batista. Ziggler defeats Harper in a singles competition ladder match at WWE TLC on pay-per-view to reclaim the Intercontinental Championship. Ziggler picks up the victory by climbing the ladder and retrieving the championship belt suspended above the ring at sixteen minutes and forty-five seconds. The Uso Brothers defeat Mizdow in two on two competition at WWE TLC on pay-per-view via disqualification. The match ends when Miz uses one of the tag team championship belts on the Usos. Due to the circumstances of the victory, Mizdow retain the championships. Bella defeats Lee in singles competition at WWE TLC on pay-per-view to retain the Divas Championship. Bella picks up the victory after spraying Lee in the eyes with a spray bottle hidden in her knee pad at seven minutes and thirty-five seconds. Rusev defeats Swagger in singles competition at WWE TLC on pay-per-view to retain the United States Championship. Rusev picks up the submission victory at four minutes and fifty seconds. Cena defeats Rollins in a singles competition tables match at WWE TLC on pay-per-view to remain the number one contender for the WWE World Heavyweight Championship. Cena picks up the victory by slamming Rollins through the table with an “Attitude Adjustment” at twenty-three minutes and thirty-five seconds. Wyatt is a guest on the Chad Dukes Wrestling Show to discuss Dean Ambrose, The Wyatt Family and Vince McMahon’s “brass ring” comments on the current roster not being ambitious enough. I heard about the brass ring and all that, as far as I’m concerned my fingertips are already grasping that sucker right now. And if I don’t, if I never grab that sucker, I’m at least gonna yank it down and everyone’s coming down with me. Riley talks to CBS Radio about his recent return to action in the WWE. I wasn’t nervous man, I was just excited. I was just so excited to get an opportunity to get back out there again because I really have missed it so much, being inside the ring and continuing to be an athlete doing all that stuff. When I drew the lucky Tyson Kidd draw for a match, because I really didn’t have any idea who I was gonna be with, that just kinda made me more excited because he’s such a pro. What a competitor and a great opponent. Steen suffers a broken nose during his debut match at NXT Takeover. WWE releases a video of him being tended to by WWE medical personnel. Ross takes to his blog to discuss WWE’s NXT Takeover event and the NXT roster. Owens is a keeper and has a uniquely, physical style that I like. Finn Balor had as memorable an entrance as I can recall in years. Neville vs Zayn could well challenge any thing we see at TLC….I hope the main roster was watching. Competition is knocking on their door. Charlotte vs. Sasha was crisp and well executed. Charlotte is getting so good that it could be scary in time. Sasha has a natural ‘attitude’ which is marketable. Great stuff from start to finish of this show. WWE releases a teaser video revealing that Steen (under the ring name Kevin Owens) will debut at NXT Takeover aired exclusively on the WWE Network on December 12th, 2014. Hogan appears on WRBL 3 News to discuss this year’s WWE Tribute to the Troops event. When I see these soldiers doing what they do, they’re the best at what they do. It really makes me proud because every one, so far, has come up to me and said, ‘Hey Hulk, I was a little, teeny Hulkster growing up,’ or ‘I’m still a Hulkamaniac!’ That’s really cool to hear that. WWE announces Edge and Christian will make a special appearance on the final edition of Monday Night RAW of 2014 on December 29th. 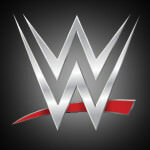 The event is being held at the Verizon Center in Washington, D.C. and will air live on the USA Network. Jericho talks to Wrestling 101 about the possibility of seeing CM Punk wrestle again. That is something you will have to ask CM Punk, I haven’t spoken to him about it. I do know in 2005 I was very burned out from wrestling and I left for two and a halfyears. If Punk does come back it might take a while because when you’re burned out you’re done, like I said it took me two and half years before I decided I wanted to come back. WWE adds Hogan to advertising for Monday Night RAW on December 22nd, 2014 in Minneapolis, Minnesota. Otunga talks to Always A-List about working on projects outside of wrestling and if he has left WWE entirely. No, not yet. I’m still with them. I’m focusing on some other stuff, but I’m looking to get back there. I’d like to win a singles title. But you haven’t seen the last of me. Green talks to WWE.com about his special appearance as the Host of WWE’s Slammy Award episode of Monday Night RAW. It’s amazing. I’m a big fan of this entire organization and this entire production. I love all these guys so it was a real thrill to get to hang out with them and especially to host the show. Uso talks to CBSLocal about Vince McMahon’s comments on the WWE locker room no longer being ambitious. As far as ambition, I feel like we do have a good crew. It’s going to take time. It’s going to take some years to get used to this thing. But as soon as we got our feet deep in the ground and our claws deep in the dirt, we’re going to be ok. I love my group of guys. I love my locker room. If you look at it we have some great talent in there. It is going to take time. It’s going to take time. That’s all I can say about it. Ross is a guest on Busted Open Radio to discuss CM Punk’s comments toward Ryback. Some guys will be very leery of trusting Phil because he brought up one of his own and shined unflattering light on Ryback, without any knowledge and based off how he looks. There will be a lot of guys alienated from that statement. Phil won’t care because he washed his hands of it. The guys who were Phil’s friends would probably just leave it alone. I think the whole thing could’ve been avoided if the problem was identified by both parties. The locker room is a very cruel place; and guys will lie to stir up a hornets nest especially when it comes to money; say a guy gets $50,000 for a PPV and they usually say they got $100,000 just to stir it up. Ziggler talks to WWE.com about his recent push in WWE and the dedication he puts into his craft. Nobody works harder than me in the ring, no one steals the show more often and no one gets better reactions for a guy who’s not even part of huge storylines. People can pick and choose what they want out of it, but I feel like I’m a modern day Renaissance man of anything you could want me to do … except be six inches taller. Punk returns to The Art of Wrestling to answer fan questions and give closure to his controversial exit from WWE. He discusses his health and the possibility of ever returning. It’s way too f—ing early. I have no interest in going back. The difference in my appearance, my mental stability, and everything across the board from now from nine, ten months ago is so drastically different. WWE has been advised that a misdemeanor arrest warrant has been issued against Heath Miller (aka Heath Slater), but we have not seen a copy or been provided with the underlying charges. Once this information is received by WWE, we will take the appropriate action. Swagger talks to DC101 about Vince McMahon’s comments toward the current WWE wrestler’s not being ambitious enough. This is an environment where literally hundreds of thousands of people want to be on this roster, and there’s what, 75 of us on top? To get here you have to be very ambitious but to stay here you need even more. It takes a lot of drive and a lot of hard work. I can only speak for myself that I have gotten hungrier. As far as the rest of the locker room, you know, it’s tough but you gotta see the finish line and sometimes that’s hard to do. WWE announces that Ziggler will receive another rematch for the Intercontinental Championship against Harper at TLC on pay-per-view on December 14th. The bout will be contested as a ladder match. Ross updates the blog section of his site to discuss Tyson Kidd, Cesaro and Vince McMahon’s apology to CM Punk. Was happy that VKM addressed the hot topic of the CM Punk matter and was surprised about the apology he made to Punk about getting his legal paperwork on Punk and AJ’s wedding day. Seems as if the door is open to resume talks some day if both parties are of that mindset. Punk’s overwhelming desire to close the show at a WrestleMania is admirable and if any one in the locker room doesn’t have that same goal every day of their professional life then they need to find another line of work.